Take a cycling tour of the Czech Republic with Hooked on Cycling. The Czech Republic has a lot to offer , it has a rich history where you shall find beautiful chateaux, romantic ruins, and pretty little rustic villages. This provides a great choice of fascinating and highly enjoyable cycling holidays. The landscape is mainly gently rolling and is criss-crossed by many small roads with almost no traffic – perfect for carefree cycling touring. There is wonderful local cuisine to be sampled, good beer and yes also pretty good wine as well. In the Czech Republic you really can experience a bike vacation which is a little different to that of its western neighbours. 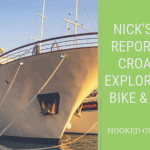 Come and explore with Hooked on Cycling!